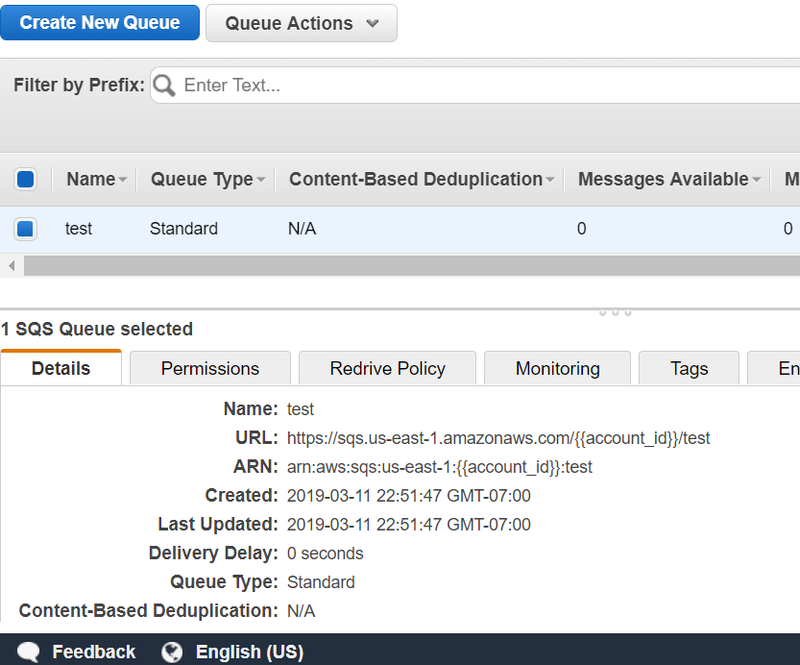 Amazon SQS is a message-queuing system that allows you to write distributed applications by exposing a message pipeline that can be processed in the background by workers. If you are in the need of a tool to facilitate distributed applications, event-driven architecture or event processing then SQS may be a solid choice to add to your tech arsenal. Compared to other popular message queues, SQS does not have up-front costs and instead you pay for what you use. This makes experimenting with SQS a compelling value-add service for your application. The application produces messages during its typical request cycle ,and once the messages are added onto the queue, the request terminates. At this point there is no confirmation that the message has actually been handled, only an effective promise that the message will be eventually processed by a worker. In the meantime there are one or more workers constantly monitoring the queue waiting for new messages to process. Once a new message is found a worker will perform the work to handle the message, and once completed the message itself will be removed from the queue. Typically a message produces artifacts in the form of data updates, data inserts or requests to other systems but the end result is the message has been handled and removed from the queue. Let’s assume we had a billing system that should charge a credit card when a user places an order. In traditional systems you would either process the billing request at the time of order submission or update a database table to signify an order is ready to be processed by a cron job that would do the actual billing action. Using SQS we can instead add a new billing message onto the queue with enough data to allow the worker to perform its task. The line between including all relevant data in the message itself versus looking data up in the worker is not a finite one. You must balance risk, cost and execution time when determining how much data to include or exclude. Now that we have a message structure we need to send it to SQS. 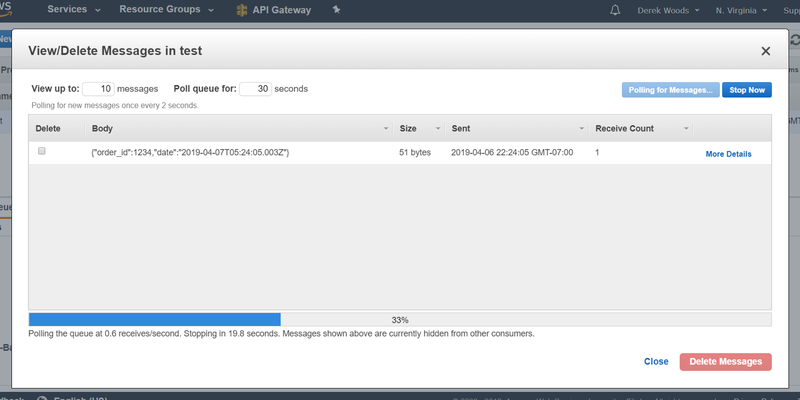 To do this we must import the AWS SDK library, create an SQS client then send the message. If you are sending more than one message at a time you will want to use sendMessageBatch which will reduce the cost and delivery time. Running the script above should yield a new message in your SQS. If you select the queue, right click and hit View/Delete Messages you should see a new message in the queue. If you ran the worker you would receive the message added in the first code segment, and now that you have the message, you are able to execute your billing strategy using the data contained in the message. You can have as many workers running as you want. Ideally the number of workers would scale with the number of messages sitting in the queue ready to be processed. You can run workers in Docker containers using ECS, a traditional EC2 instance or even tie the SQS queue directly to a Lambda for processing. Depending on how you deploy your workers you can leverage auto-scale properties to make sure your workers scale with the number of messages in the queue. For purposes here we will just run the worker manually. As you can see setting up and integrating SQS into your application is pretty simple and opens up a lot of opportunities to add scaling and stability to your application — all without needing to worry about server setup. All of these combined make SQS a compelling offering and one you should consider in your current, or a future, application. Thriving in the tech industry for 15 years I'm always looking at the cutting edge of upcoming advancements in technology.